The composer Pavel Haas remains best known perhaps not for his music but for the fact that he was interned in Terezin and died in Auschwitz. This new disc from Resonus Classics presents us with four of Haas's song cycles stretching in time from the period of his study with Janacek to his time in Terezin. 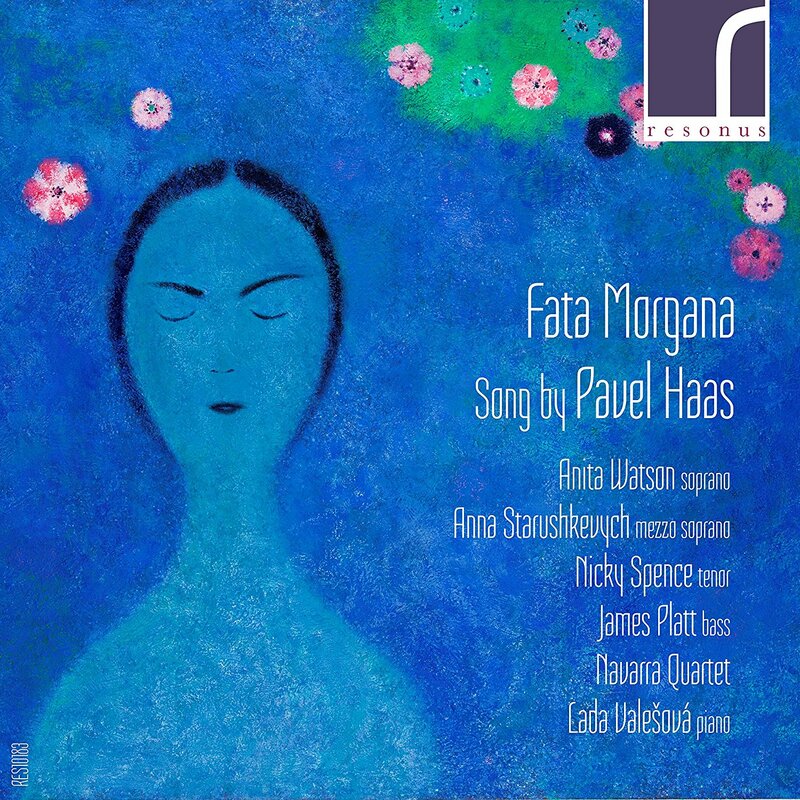 Pianist Lada Valesova performs with soprano Anita Watson, mezzo-soprano Anna Starushkevych, tenor Nicky Spence, bass James Platt, and the Navarra Quartet in Haas's Seven Songs in Folk Style, Fata Morgana, Chinese Songs and Four Songs on Chinese Poetry. Written in 1923, Fata Morgana was the first major work Haas wrote after finishing his studies with Janacek. Scored for tenor and piano quintet, it is performed by Nicky Spence, the Navarra Quartet, and Lada Valesova. The piece sets poems by Rabindranath Tagore (very much in fashion in the period. and Janacek had set some Tagore in The Wandering Madman in 1922). The poems, from The Gardener, are set in Czech translations and deal with the poets desire for an ephemeral lover. The opening song, 'When she passed me by with swift footsteps' seems very French in atmosphere and whilst Nicky Spence's solo is finely rhapsodic, it is the instrumental parts which we notice with some substantial instrumental interludes. This mood continues into the subsequent songs with the second, 'The night is the night of the ripe May', having a terrific long postlude which flows directly into the third song, 'My heart, the bird of the thickets' . Here the rather wordy vocal line contrasts with the long romantic instrumental interludes. The fourth song, 'My beloved, my heart yearns day and night' has more of a dramatic edge to it, vividly projected by Nicky Spence and the instrumentalists. Here the French influence seems to give way to that of Haas's teacher, Janacek. With the final song, 'You are the evening cloud', the mood of the previous one with its hints of Janacek continues. This is the work's first recording and it seems strange that such a major piece should be neglected, though I did wonder whether it might be possible to perform it with Tagore's English words. Mezzo-soprano Anna Starushkevych and Lada Valeslova perform Pavel Haas's Chinese Songs which date from 1921, the earliest pieces on the disc. They were written whilst he was still a student in Janacek's class, and set Czech translations of Chinese poetry. The first song, 'Sadness', is spare and rather austere, with bleak harmonies. The second, 'On the River Jo-Yeh', keeps this spareness until a sense of transparency in the writing. The final song, 'Spring Rain', returns to the mood of the first, though with more drama and a feeling of free arioso. Haas returned to inspiration from the Chinese with his Four Songs on Chinese Poetry which was written whilst he was interned in Terezin. The poems were selected from The New Songs of Ancient China by the Czech poet and translator Bohumil Mathesius. Here the shadow of Janacek is most definite, though Haas's own voice is clear too. The first, 'I Heard Wild Geese', has dark harmonic hints with a sense of underlying drama. The second, 'In a Bamboo Grove'. pairs a vibrantly declaimed vocal line with some dramatic piano writing, and a surprising hint of Shostakovich. The bleaker third song, 'Far Away the moon is from Home' continues the sense of declamation in the vocal line. The last, 'Sleepless Night', is again dark and complex. The songs present a distinct and bleak vision very far from the folk and French influences but the ending seems surprisingly up-beat. The song receive terrific performances from James Platt and Lada Valesova. The music of Pavel Haas is still not well known. His early death in Auschwitz and the fact that during his lifetime he remained in the relatively remote town of Brno, have both contributed to his neglect. This admirable new recording enables a new generation of listeners to discover Haas's music.